Politicians everywhere have lost the plot. The Congress Party, the Bharatiya Janata Party, the Democratic Party and the Republican Party in the US, the Conservative Party and the Labour Party in the UK, and so on — ALL of them have the word party in their name. Clearly, politics is supposed to be a party, and, like all parties, it’s supposed to be fun. And when it is fun, it really changes things. Look at the Obama campaign, for instance. People working on it were having a blast. They were so excited because they believed they were changing things — and, indeed, they were. Using a strong understanding of technology and every (clean) trick in the book, they steamrolled the political establishment in the US. It felt like — and it was — a revolution. Obama himself was merely the leader. While not taking anything away from his personal capability, skills and integrity, he won because it was time for a change, not the other way around. Well, guess what? In India, IT’S WAY PAST TIME FOR A CHANGE. I don’t think there’s anybody that would disagree with that. So, I have decided, following on the point I started with, that to bring about this change, I am going to float a new political entity: THE PARTY PARTY. Everybody is invited; indeed, everybody is de facto a member, which makes us the largest political party in the world — with something over six billion members. So, come on down! We are in process of fundamental change. What we will create is very simple: a government that is completely responsive to the people. This covers everything — no criminals in politics, zero corruption, greater equity of opportunity, etc etc. And, not to forget, we need to have fun while bringing about this change. The good news is that I’ve found just the event organizer to make this happen. 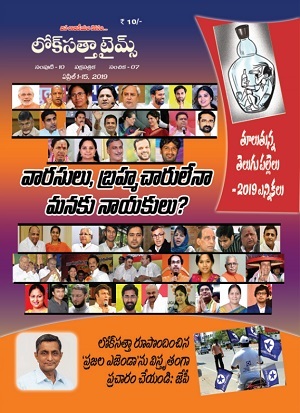 Lok Satta, a social service organization, founded some 15 years ago by Dr Jayaprakash Narayan in Andhra Pradesh, has recently floated a political party, which understands that politics has to be fun. It is, of course, supremely skilled from a technical standpoint, and understands very clearly the structural changes that are needed to get to a 100 per cent responsive government. For instance, the first past the post system of elections we currently use is a direct cause of much of the unaccounted money in politics. Since it’s an all or nothing race, political parties stoop to any level — buying votes, intimidating voters, and more — to capture the prize. If instead we had proportional representation, a large part of this need for money would disappear. And if this need disappeared, much of the need for “black” money in the economy would disappear. And, guess what? Proportional representation is already permitted in the Indian Constitution — in fact, the first two elections (1950 and 1954) were run in that way. So, this will be one plank for sustainable change. Another key requirement is to ensure internal democracy in political parties. Today, the party boss (or high command) decides who gets the ticket, usually (or often) depending on money changing hands. Thus, only rich — and, often criminally rich — people get seats to represent us. It usually has nothing to do with us. This has to change. 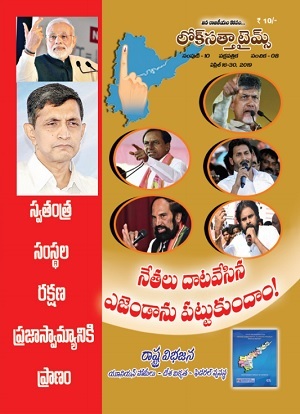 Structurally different from any other party in India, Lok Satta already has a democratic system in place. Aspiring candidates will first be vetted by an independent election commission, after which they will have to run in primaries (like in the US elections) with party members voting to decide who will be selected to represent us in the general election. And, of course, we need to change the way Bombay is run. Everybody understands that cities need to have autonomous, accountable governments. Lok Satta has already developed a bill to enable this, but none of the party-is-God governments in power could even think about accepting it, because it would undermine the power of the state chief ministers and then who would bring in the much-needed bucks? Undercutting the need for bucks might open this door, but, in addition, Lok Satta has been proposing direct election of state chief ministers, which would link the electorate directly with the representative and foster greater accountability. Greater accountability and making government truly representative of the people is the singularly most important piece of Lok Satta’s programme. To this end, there are already party volunteers working in each of the 40 polling stations in the municipal corporator ward won by Adolph D’souza in 2007 (with Lok Satta’s support). The volunteers monitor the needs and what is going on in their respective areas, and communicate this information to Adolph in monthly meetings, who, in turn, raises these issues in the Corporation. This is what government is supposed to be — a system that listens to what the people want, selects fairly between conflicting needs, and implements its final decision in an efficient and transparent way. Change is already happening, and, as a member of the Party Party, you are part of the change. Contact me or info@loksattaparty.com to get more involved. The party’s just starting and don’t forget your dancing shoes. Just make sure you’re ready to have more fun than you’ve ever had in your life.